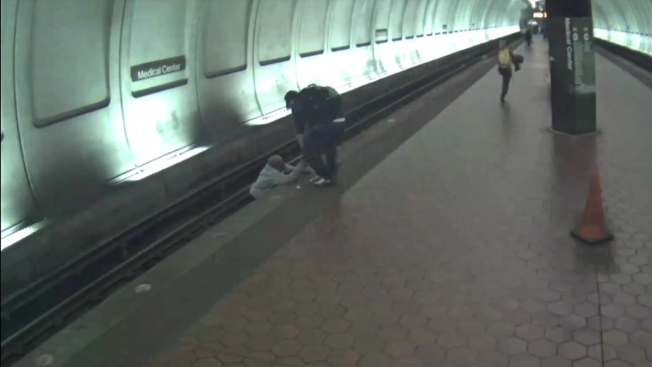 Footage from a Metro security camera captured the moment a blind man fell onto the train tracks at the Red Line's Medical Center station on Tuesday and the terrifying moments before good Samaritans rescued him. The video shows the moment the passenger walks along the station platform and falls over the edge onto the tracks below. The man managed to stand up and nearby passengers run to the edge to help the man, pulling him back onto the platform, seconds before a train arrives at the station. Metro says the man was taken to the hospital with injuries that were not life-threatening. He is expected to be okay. This is not the first time an incident like this has happened. In May 2018, a visually impaired woman fell onto the tracks of the Van Ness station. She was apparently looking for a door to one of the Metro's newer 7000-series rail cars and mistook a gap between two cars for the entrance, stepping off the platform and onto the tracks. The Federal Transit Administration ordered immediate changes and Metro promised to switch the rubber barriers between trains to sturdier metal chains.